If you have kids, you know how popular slime is! All three of my kids LOVE to make slime. Did you know that there a million ways to make slime, too? Well, maybe not a million…but a lot! 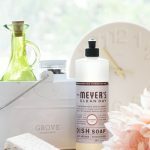 There’s fluffy slime, slime with baking soda, slime with borax, slime without borax, slime with pudding (YES, this is a thing), and many more! 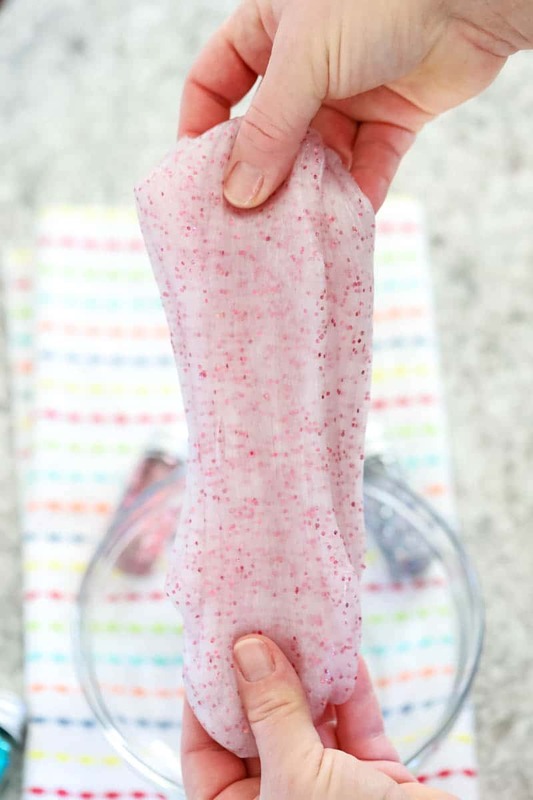 Today I’m sharing a SUPER EASY slime recipe that you won’t have any trouble at all making! 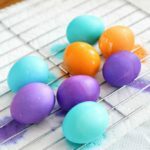 This Slime Recipe is so easy to make! You only need 3 ingredients! That’s it! 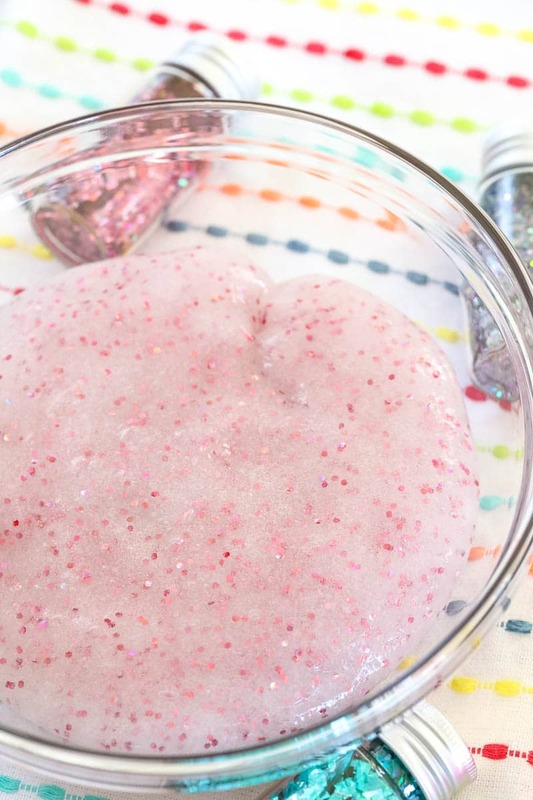 We like to make our slime all pretty and add lots of glitter, but that’s optional. I know that some people would rather not have the glitter in their house. BUT if you do it correctly, you won’t have glitter on your hands, tables, and floors. It stays right in the slime with this recipe. Just follow along! 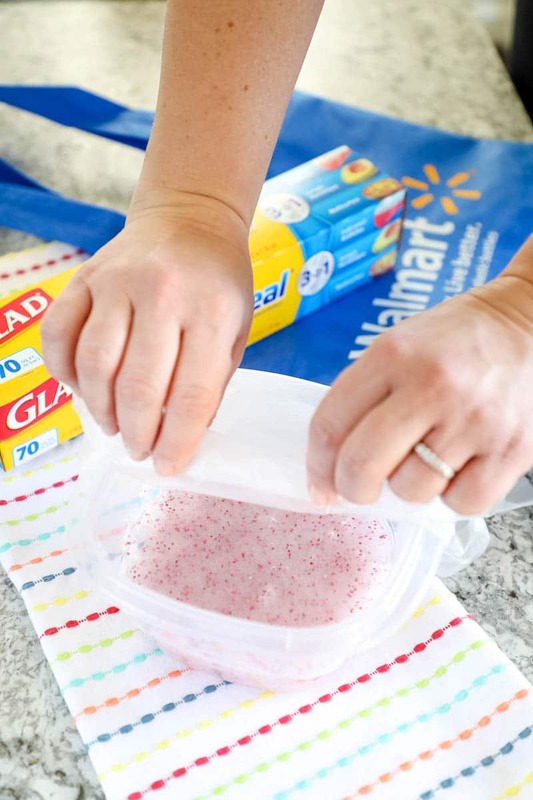 There’s no need to buy slime at the store when you can make it right at home! 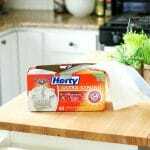 Make Easy Slime At Home! First, take 1 cup of glue and add it to a larger bowl. Sprinkle glitter right over the top of the glue. I used about a tablespoon here. Next mix 1 cup of warm water with 1 tablespoon of borax to add to the glue mixture. Add a tablespoon of the borax/water mixture to the glue and mix well after each addition. It usually takes about 4 tablespoons. You just mix and pour. Mix and pour. Mix until the slime isn’t sticky anymore. Continue to knead and mix. When you’re done playing with your slime, add it to a container and cover well. Glad® Press’n Seal® is PERFECT for this! Watch my video below on just how easy it is to make slime at home! Make sure to cover your slime well after you’re done playing with it. It will keep for weeks! Believe me, I know! We have containers of it all over the house! haha! 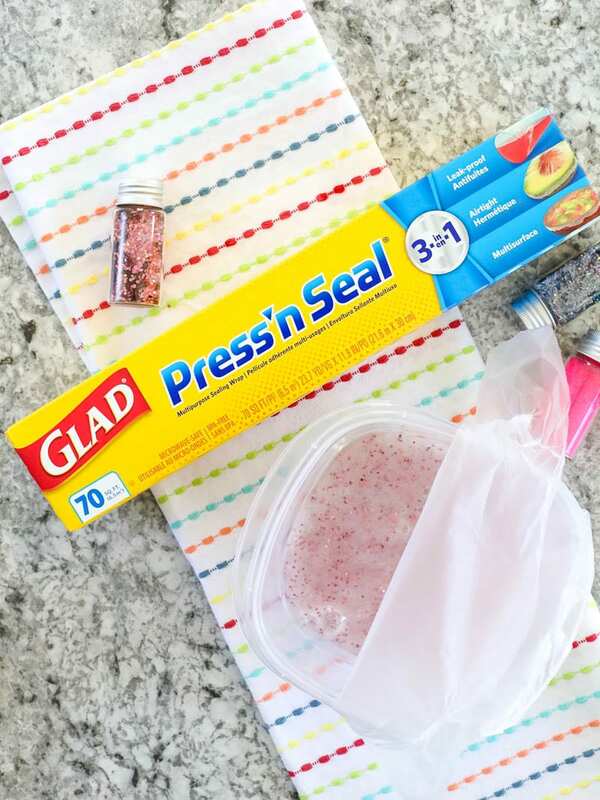 With just a quick press of a finger, Glad Press’n Seal creates an airtight seal that keeps food & craft supplies fresher, longer. 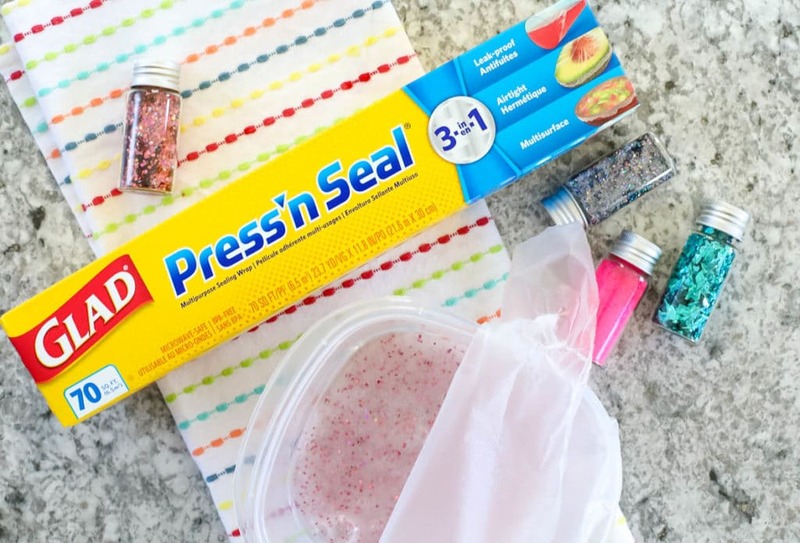 Glad Press’n Seal isn’t just for food, it’s for all your crafty items, too! It’s perfect for covering any container you don’t have a lid for. You know, like all those little plastic containers in your pantry that never seem to have the right lid to cover it?! It also seals to almost anything! 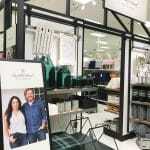 Griptex technology allows Glad Press’n Seal to adhere to plastic, paper, wood, metal, glass and more! You can pick up Glad Press’n Seal and all the other ingredients listed at Walmart. Walmart always has the best prices and everything is easy to find. I love that no matter what Walmart I go into, I always know where things are. No walking around aimlessly forever looking for things! 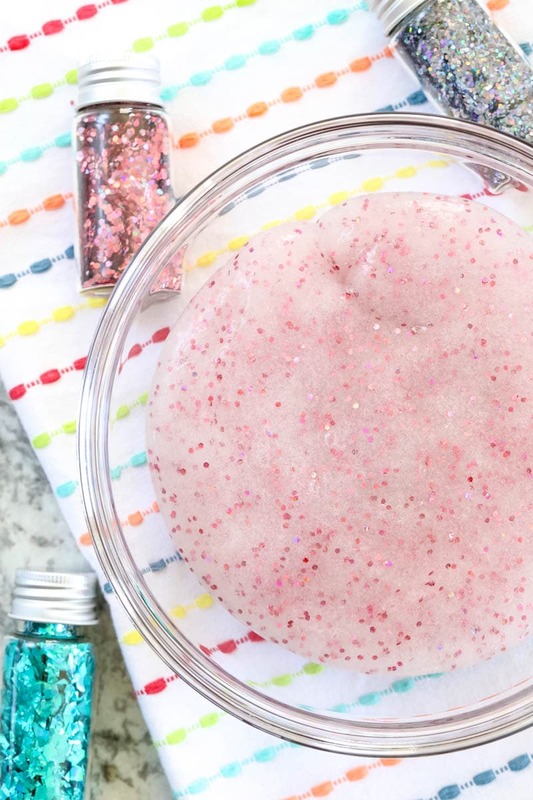 Make sure to try out this 3-Ingredient Slime Recipe in your home soon! And don’t forget the Glad Press’n Seal to keep things fresh! For more fun, try these posts next!